The Morrigans Birth,Death & Rebirth BurláGhuí. Through this circle we will come together to create and offer a BurláGhuí, a prayer bundle to the Morrigan, to acknowledge all she represents within each of us, and allow a time for us to reclaim and acknowledge her in all her glory. “The full moon workshop was a really lovely experience. Laura was a great teacher and made everyone feel so welcome. It was paced perfectly with a balance of yoga and relaxation. I would thoroughly recommend taking the time to attend and give yourself a few hours in such a nice environment.” D.W. Places will be limited to 10 people and must be pre-booked / pre-paid. Tea, coffee & biscuits will be provided. 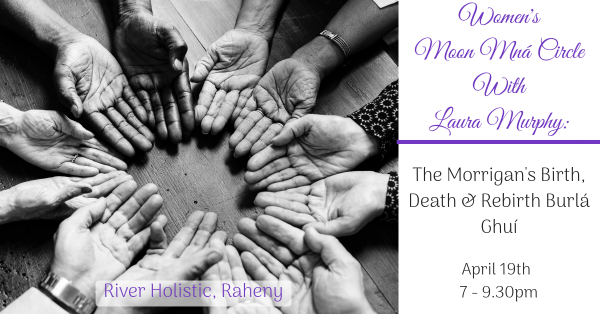 Bookings can be completed here: https://www.loveyourlife.ie/morrigan-womens-moon-mna-circle or by contacting Laura on 085 8225450.